The below (September 11, 2017) is the is the second of two essays by Fr. Twomey on Amoris Laetitia. The first article, “Amoris Laetitia and the chasm in modern moral theology,” was posted on September 1st. Recently, Archbishop Victor Manuel Fernández published an article in Medelin, the theological periodical of the Latin-American Bishops’ Conference. It is entitled: “Chapter VIII of Amoris Laetitia: What is left after the storm” (translated into English by Andrew Guernsey). It is a long, rather diffuse commentary on the Pope Francis’s Letter to the Bishops of the Region of Buenos Aires approving their interpretation of the Apostolic Exhortation, Amoris Laetitia. The letter itself was only recently put up on the Vatican website. The author is the titular Archbishop and Rector of the Pontifical Catholic University of Argentina. He is known to be a confidant of Pope Francis, and may indeed have been the ghostwriter of the Exhortation or part of it. For this reason alone, his essay deserves serious attention. What is most striking about the essay is its methodology. It is, on the one hand, an attempt to prove the orthodoxy of what Archbishop Fernández claims to be the “novelty” of Amoris Laetitia Chapter 8 by showing how it fits into the pattern of former changes in Church teaching and discipline, such as happened to St Cyprian’s soundbite, “no salvation outside the Church”, or to the right to religious freedom. Even more striking is the number of times Archbishop Fernández attempts to show different nuances in sayings of Pope John Paul II and Pope Benedict XVI, whose orthodoxy is above reproach, to bolster his cause. This would seem to be an implicit admission that the orthodoxy of Pope Francis is not evident. The trouble with the Archbishop’s examples of earlier developments in Church teaching/discipline”—”novelties,” in the language of Archbishop Fernández— is that they are treated in an a-historical way; that is, no attention is paid to the changing social and cultural developments that lead, for example, to the changes regarding the teaching on religious freedom (condemned by the Papal Magisterium in the 19th century and embraced by the Second Vatican Council in the 20th century), or the centuries-long theological developments that lead to a new understanding at Vatican II of St Cyprian’s teaching about no salvation outside the Church. By way of contrast, the profound moral and sacramental theological issues involved in the Church’s teaching (and corresponding discipline) have been singularly constant since the early Church, even allowing for disciplinary developments over time, such as separation (from bed and board), nullity procedures, etc., all of which were responses to complex pastoral situations while remaining faithful to the teaching of Christ thanks to a more profound theological grasp of the issues involved. None of this, it seems to me, applies to what Archbishop Fernández describes as the “novelty” of Pope Francis. On the other hand, when the Archbishop comes to deal with the actual content of the Pope’s “novelty”, his methodology is that of the refined casuistry characteristic of the proportionalist school of moral theology. That casuistry can be reduced to the moral principle that hard cases should allow exceptions to the norm. Fernández is an exegete by training, not a moral theologian, but evidently was, as a seminarian, schooled in the post-Vatican II legalistic tradition that became known as proportionalism. The latter was developed in reaction to the legalism of the pre-Vatican II manualist tradition, which tended to rigorism. There is an irony in the fact that both moral-theological traditions echo the casuistic schools of the ancient scribes and Pharisees in their treatment of divorce; neither is rooted in the classical New Testament approach to morality in terms of virtue, developed especially by St Thomas Aquinas and those scholars who have recovered his approach, such as Servais Pinckaers, OP, the principal author of the fundamental theology section of the Catechism of the Catholic Church. Archbishop Fernández is, in effect, a casuist, the mindset of which is legalistic or rule-based. It is, I suggest, seriously inadequate to the task at hand. And this is the crux of the matter: under what circumstances? The Archbishop speaks about the “novelty” of Pope Francis’s teaching, which, it is claimed, “does not imply a rupture, but rather a harmonious development and a creative continuity with regard to the teaching of previous Popes.” This demands a different way of thinking, Fernández claims, about the consequences of the [absolute] norm, namely “discernment with regard to its disciplinary derivations“. Those disciplinary derivations, he claims, hinge on the traditional distinction between objective sin and subjective guilt. Someone cohabiting in a second union who recognizes that this is gravely wrong but is unable to avoid living more uxorio due to his or her circumstances may, after due process of discernment with his or her confessor, be considered to be subjectively without guilt, or at least with diminished guilt, and so can be admitted to the sacraments. Such would appear, prima vacie, to be in fact a novelty in the strict sense of what in the early Church was termed a novum, namely a teaching that contradicts the thrust of traditional teaching. In other words, a heresy. This is because the traditional teaching on those factors that diminish subjective guilt apply to offenses committed in the past. They do not apply in anticipation of doing something in the future that one knows to be objectively wrong. The only way this supposed “novelty” of Pope Francis, if such it is, can be understood is in terms of persons living in an irregular situation having a firm purpose of amendment, as tradition teaches. This is a point I developed in my previous article, leaving aside the question as to where this possibility is realistic (many would say it is not). If he left it at that, it would be fine, but Archbishop Fernández seems to imply more than that that, which makes his thesis problematic. But Pope John Paul II in Veritatis Splendor #56 expressly rules out any such “exceptions for a proportionate reason”! Without the firm purpose of amendment, the Pope’s new general rule—or novelty—could be seriously misunderstood. 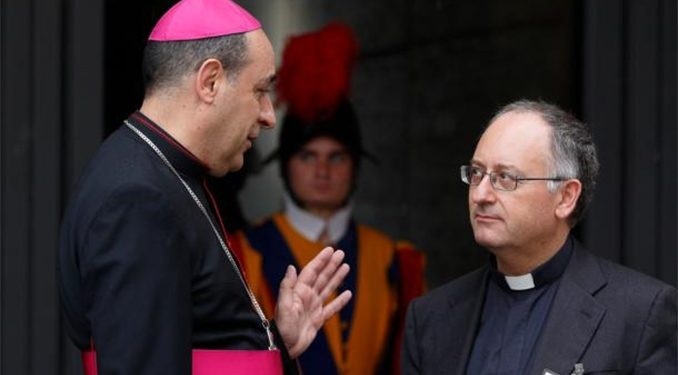 One respected blogger accuses Archbishop Fernández of defending adultery. I don’t think that such an accusation is justified. And here I find myself in agreement with the Archbishop that the terms “adultery” and “fornication” should not be used with the abandon practiced by some commentators critical of the Apostolic Exhortation. And yet, both terms refer to gravely serious sins, both are offenses against not only against chastity but also against justice, both are intrinsically evil. And both are trivialized today in our highly promiscuous culture, which culture itself is a factor in marriage breakdown and a mitigating factor at the subjective level. But, nonetheless, those terms cannot be entirely avoided. From the above, one can see how the ambiguity of Archbishop Fernández’s interpretation of Chapter 8 could be understood to justify the worst fears of the renowned philosopher, Josef Seifert, who claimed recently that Pope Francis in AL #303 in effect teaches that “we can know with ‘a certain moral security’ that God himself asks us to continue to commit intrinsically immoral acts such as adultery or homosexuality” (Aemaet, 2017). I don’t think that this is what Pope Francis is teaching, but the ambiguity of the text does allow for such an interpretation. That possibility alone makes it imperative that the dubia of the Four Cardinals are addressed by the CDF, since the implications for the whole or moral theology are indeed enormous, if such were the case. It was precisely to counter characteristic thesis of the Proportionalist school of moral theology that Pope John Paul II wrote the encyclical, Veritatis Splendor, the first ever on fundamental moral theology. Which brings us to the question of the nature of the authority (and so the binding force) of Amoris Laetitia as well as that of the Letter of Pope Francis to the Bishops of the Region of Buenos Aires. Archbishop Fernández is under the impression that Amoris Laetitia is an encyclical; that is the term he himself uses to describe it. But it is not an encyclical. It is a post-Synodal Apostolic Exhortation, and so does not carry the same weight. Fernández compares the Pope’s Letter endorsing the interpretation given to Amoris Laetitia by the Argentinean Bishops with Pope Pius IX’s Letter approving the German Bishops’ interpretation of the teaching of Vatican I on Papal Jurisdiction in response to Bismark’s misunderstanding of same. The comparison limps. The latter letter dealt with a misunderstanding of a clear dogmatic definition by an Oecumenical Council and was addressed to those outside the Church (the German Chancellor). The Argentinean Bishops give their interpretation of an ambiguous chapter of a hotly contested post-Synodal Apostolic Exhortation to the faithful within the Church. Be that as it may, the essential question is: To what extent is Amoris Laetitia an expression of the Papal Magisterium and so binding on conscience? My own studies into the nature of the Primacy of the Bishop of Rome led me to recognize that the Petrine authority is based on conscience, the Pope’s own conscientious judgement before God, which makes it binding on the conscience of the faithful. Cor ad cor loquitur, as Newman put it. This was exemplified, for example, in the way Humanae Vitae was written. After Blessed Pope Paul VI had received the conflicting reports of the Birth Control Commission, he retired to Castel Gandolfo to study them, together with other opinions, before he made his own conscientious judgement fully aware of his own unique responsibility as Bishop of Rome. This the Pope himself expressly affirmed in HV #6. He had rejected the opinion of the Majority Report submitted to him by the Birth Control Commission: a clear example of judgement made in obedience only to God’s truth after he had sifted the various opinions. Humanae Vitae is an encyclical. So too is Veritatis Splendor. As already mentioned, Amoris Laetitia is but an Apostolic Exhortation. Granted that Veritatis Splendor was not entirely from the pen of St Pope John Paul II, it can be assumed that not one word was published that he did not examine and personally approve, given the gravity of the issue: the very nature of morality. He was, after all, a moral philosopher who was sure of his ground, and he was acutely aware of the threat of Proportionalism. For this reason, Veritatis Splendor is binding in a way that AL cannot be. This is important since Cardinal Christopher Schönborn, OP is on record as claiming that all previous teaching of the Magisterium must be interpreted in the light of Amoris Laetita. In an interview with Father Spadaro, he said: “AL is an act of the magisterium that makes the teaching of the church present and relevant today. Just as we read the Council of Nicaea in the light of the Council of Constantinople, and Vatican I in the light of Vatican II, so now we must read the previous statements of the magisterium about the family in the light of the contribution made by AL.” Here I should beg to differ from my colleague and old friend—or rather I beg to distinguish. It might be possible to make such a comparison (which nonetheless seems exaggerated to me) with regard to Chapters 4 & 5 (which is a synthesis of previous teaching on conjugal love and fertility that yet goes beyond the former teaching), but not with regard to the controversial Chapter 8 (as compared with the previous teaching of Paul VI, John Paul II, and Benedict XVI). Perhaps Cardinal Schönborn was simply referring to the teaching of Familiaris Consortio. Like Amoris Laetitia, Familiaris Consortio is also a post-Synodal, Apostolic Exhortation dealing with the family. But even here, Familiaris Consortio is the teaching of a Pope who had written extensively on the philosophy and theology of marriage and conjugal love. It expresses with great clarity his own conscientious judgement. And so it carries a binding force, I suggest, which is stronger than Amoris Laetitia, the crucial chapter of which does not have the hallmarks of coming from the pen of Pope Francis (unlike Chapters 4 and 5) and is anything but clear. Evidently Pope Francis approved the text of Chapter 8, for which reason it does have a magisterial weight. But since Amoris Laetitia differs in some important aspects from Familiaris Consortio (mostly by way of omission), then the weight to be given to the one or the other depends on the extent to which either document is in harmony with the encyclical Veritatis Splendor. The reason for this hermeneutical rule is that Veritatis Splendor is an encyclical that addressed those issues in fundamental moral theology which are at the core of the present controversy about the interpretation of Amoris Laetitia, Chapter 8. I have my own reservations as to the modus operandi of the Four Cardinals. For example, I don’t think they should have published their letter to His Holiness, Pope Francis (and to the Prefect of the Congregation for the Doctrine of the Faith). But now it is public, and the issues they raise are legitimate concerns, and so their letter cannot be ignored. Equally serious are the implications for the Primacy of the Bishop of Rome and his authority, should the orthodoxy of the Pope himself be left in doubt. Archbishop Fernández’s essay attempted to dispel that doubt but, in my opinion at least, has only exacerbated it.